haverhillchamber.com | FREE HEATING FUEL FOR A YEAR!!! FREE HEATING FUEL FOR A YEAR!!! 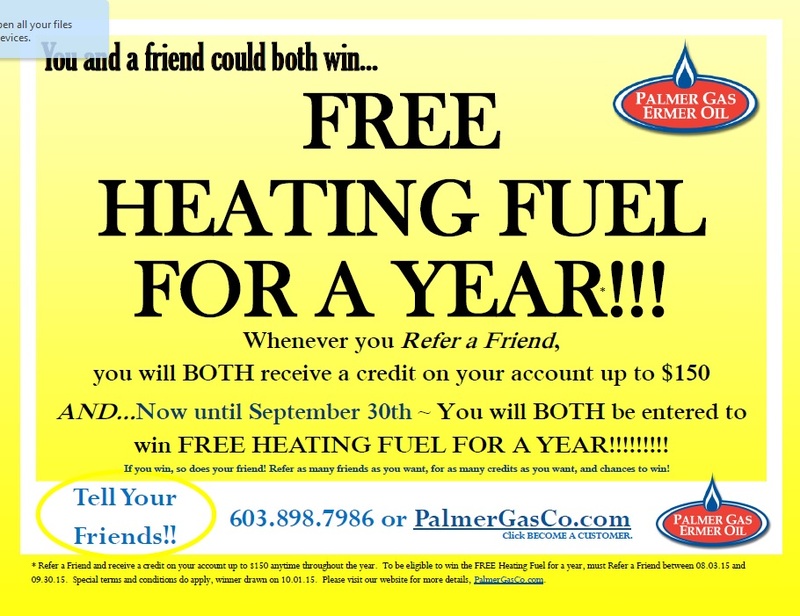 Palmer Gas Ermer Oil has the best REFER A FRIEND program around! Whenever a new or existing customer Refers a Friend that becomes an active customer, you will BOTH receive a credit on your accounts up to $150*!!! 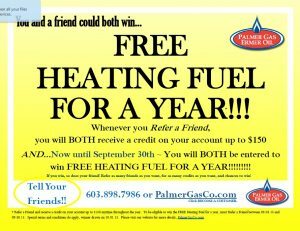 Additionally, from now until September 30th you will BOTH be entered to win FREE HEATING FUEL FOR A YEAR*!! If one of you wins, so does your friend!! You can refer as many friends as you want, for as many credits as you want! *Visit our website PalmerGas.com for more details, terms and conditions apply.